I liked the map I put up yesterday, but then I found this one (via chartporn) which is even more fun. 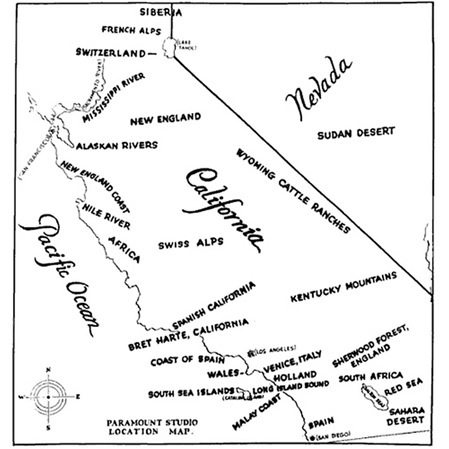 It’s from 1927 and it was a guide to where in California you should shoot your movie if you wanted it to look like other regions of the world. I like that “Sherwood Forest, England” is it’s own category. I went a little crazy when I saw rhododendrons in the opening scenes of Last of the Mohicans. I said, “no way…they filmed this in North Carolina.” Sure enough when the credits rolled around — North Carolina. They could have at least had the decency not to do a *closeup* of Hawkeye peering through a rhododendron — of which there are none in the Adirondacks or Vermont. Most Robin Hood movies were actually filmed closer to the Coast of Spain. The Sherwood Country Club in Thousand Oaks, CA is situated where the Errol Flynn Robin Hood was filmed.